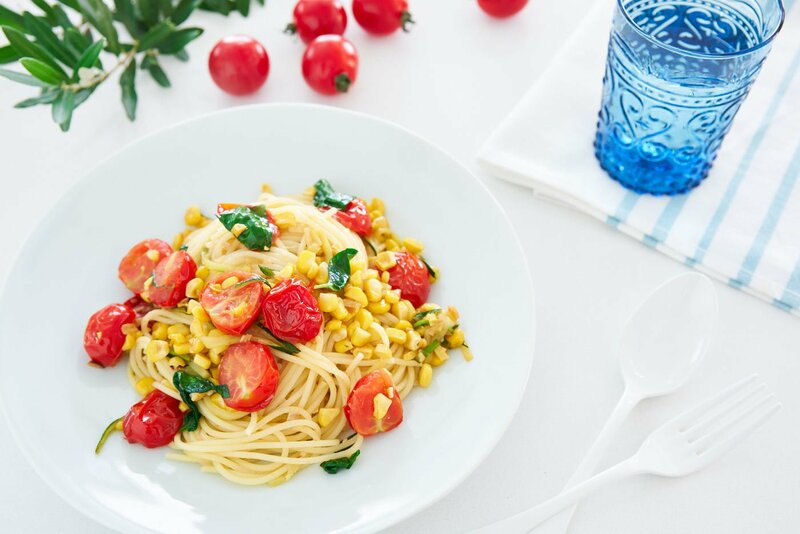 With crisp sweet corn, sun-drenched tomatoes, and tender zucchini tossed with thin spaghettini, this simple Pasta Estate is like an edible ode to summer. It takes less than 10 minutes to make, which means you can spend less time in the kitchen and more time enjoying the season. If Pasta Primavera had a sibling for the three other seasons of the year, then this Pasta Estate (pronounced es-TAH-teh), would quite literally be summer (Estate means summer in Italian). As far as I’m aware there isn’t actually a dish called Pasta Estate in Italy, but if a French chef in New York is allowed to name a pasta after spring, why can’t summer have a pasta too? Aromatic – These are fragrant vegetables and herbs that add flavor to your pasta. I recommend including some type of Allium such as garlic, onions, or scallions here and sauteeing them a bit at the beginning to bring out their sweetness and flavor. Herbs, such as basil, oregano, or thyme are best added towards the end to preserve their fresh flavor. Umami – The garlic, corn, and tomatoes in my pasta are brimming with umami producing amino acids. This is what gives this dish a savory depth that will make the corners of your mouth turn up into a satisfied smile, despite the lack of meat. 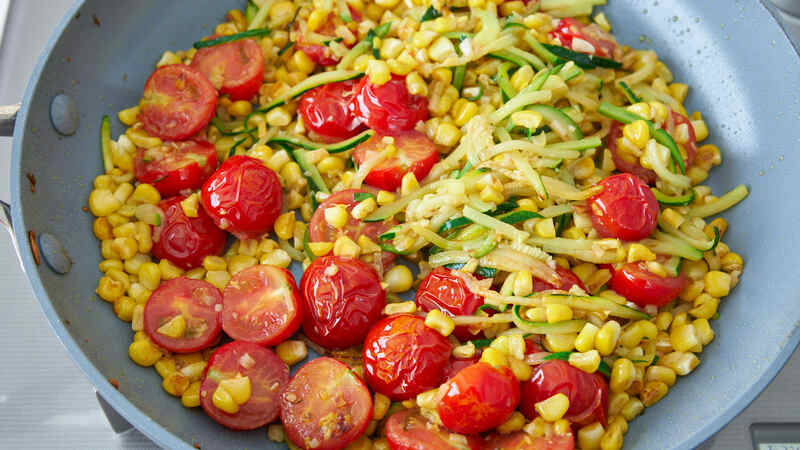 Texture – The corn adds a crisp contrast to the al dente pasta, tender zucchini and juicy tomatoes. Other vegetables like celery, jicama, and lightly cooked peppers would be good alternatives. Some may argue that pasta is pasta and that the kind you use doesn’t matter, but for me, every pasta dish tells a story, and the type of pasta that you use becomes part of the plot. Aside from practical considerations like using a shape that’s suitable for holding onto the style of sauce you make, the thickness, length and curvature can make the finished dish light and playful or substantial and imposing. 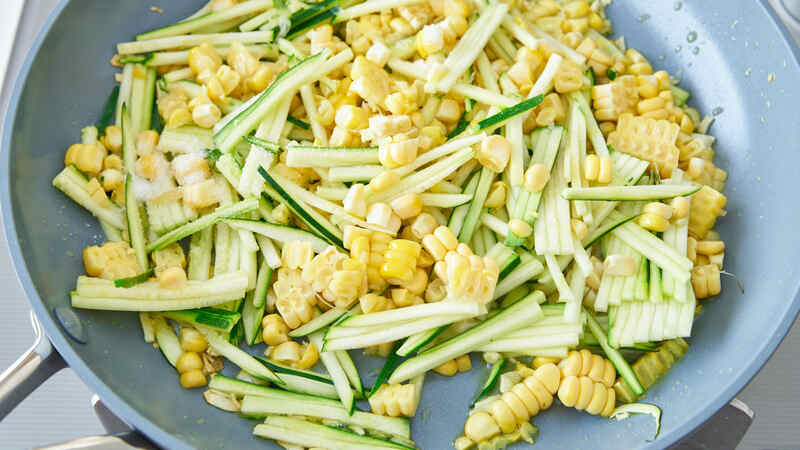 For this dish, I knew I wanted a long straight pasta as they tend to be a bit more delicate while being adept at hanging onto thin strips of veggies like the julienned zucchini. I ended up going with spaghettini which is the perfect balance between featherweight Cappellini and regular spaghetti. It has enough substance to stand up to the crisp corn and yet it’s delicate enough to allow the vegetables to shine through. 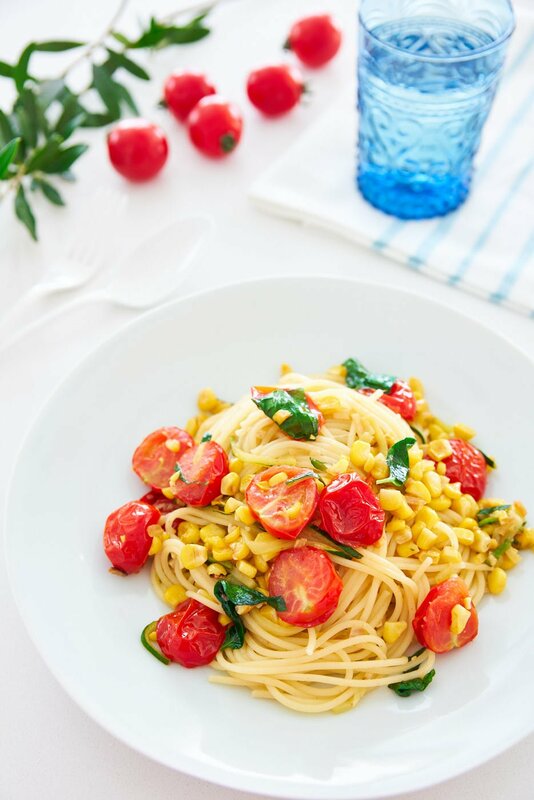 Look closely at the plate, and you can almost see rays of summer sunshine bursting out from between the strands of spaghettini! Of course, if all you have on hand is spaghetti or even something heavier like Strozzapreti, they will work in a pinch. Whatever pasta you choose, I like to finish cooking it in the pan with the sauteed veggies to marry their flavors. That’s why I usually cook the pasta for 2 minutes less than what it says on the package. There’s technically no sauce here, so you’ll want to reserve a bit of the boiling liquid and add it in with the veggies and pasta. This helps to release some of the caramelized vegetable juices from the pan while adding a bit of starch that allows this invisible sauce to coat everything in a layer of flavor. I made this plant-based because it was hot and I wanted something bright and refreshing. If you’re not vegan and prefer something with a bit more body, try sprinkling on some parmesan cheese at the end. It makes the umami in the corn pop while the fat mellows out the acidity of the tomatoes. Bring a pot of well-salted water to a boil. 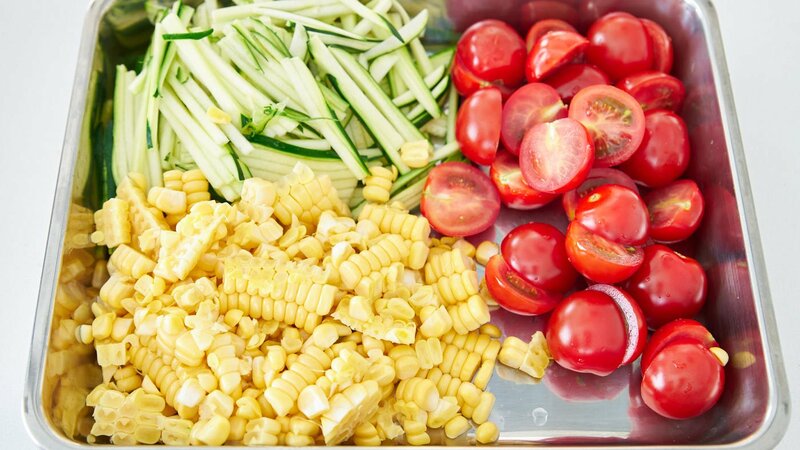 While you’re waiting for the pasta to boil, prepare the tomatoes, corn, zucchini, and garlic. Add the pasta to the boiling water and set a timer for 7 minutes. In a frying pan over high heat, add the olive oil and garlic and swirl until the garlic is fragrant (don’t let it brown yet). Add the zucchini, corn, and salt and sauté until the zucchini is tender. Add the cherry tomatoes and sauté them until their skins have shriveled and they are very tender. When the pasta is done, reserve some of the cooking liquid and then drain the pasta. 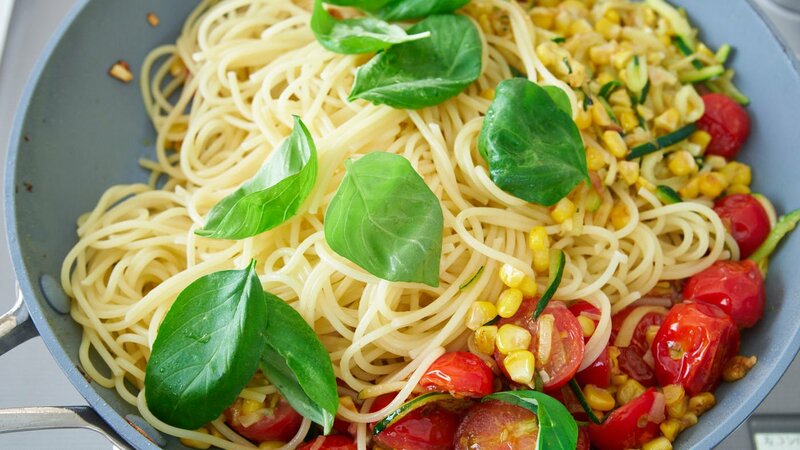 Add the pasta and basil to the tomatoes and corn. Add the reserved pasta liquid a little bit at a time, tossing everything together in the pan until the pasta is cooked to your desired texture.